Nutanix (NTNX) reported a strong Q4 earnings report last week with solid guidance headed into F19. After trading down 7.4% post-earnings, this provides investors a great opportunity to take advantage of an undervalued named as their transition to a software-only model remains on schedule. Total revenue increased 47% for the year and 49% for Q4, both of which are significant feats for a company who just surpassed $1 billion in TTM revenue. 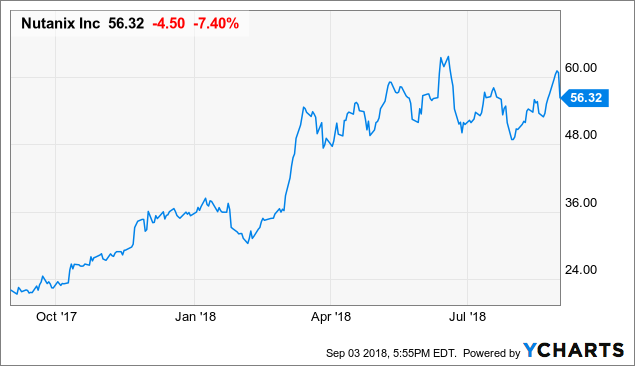 With gross margins approaching 80%, NTNX is poised to re-rate close to pure-play software companies, which typically trade at forward revenue multiples of 7-10x. As NTNX phases out their pass-through hardware sales, they will begin to focus solely on their software business, which generates higher margins and has much greater visibility into future revenues. NTNX announced this transition in Q1 and I previously wrote an article going through this transition and how NTNX should now be valued. The recent post-earnings pull back provides a great opportunity for investors to build and increase their holdings in the leading HCI player. During Q4, NTNX grew their software and support billings by 66%, which slightly decelerated from 67% in Q3. Investors should expect slight deceleration from a $1b+ revenue company growing billings at this rate. However, the mere 1 percentage point deceleration is an impressive feat in itself.